Installing deck balusters and railing is a DIY friendly project. Take a look at the most common customer questions below, or give us a call at 1-888-824-5316 to speak with one of our deck experts. Do I need a railing on my deck? 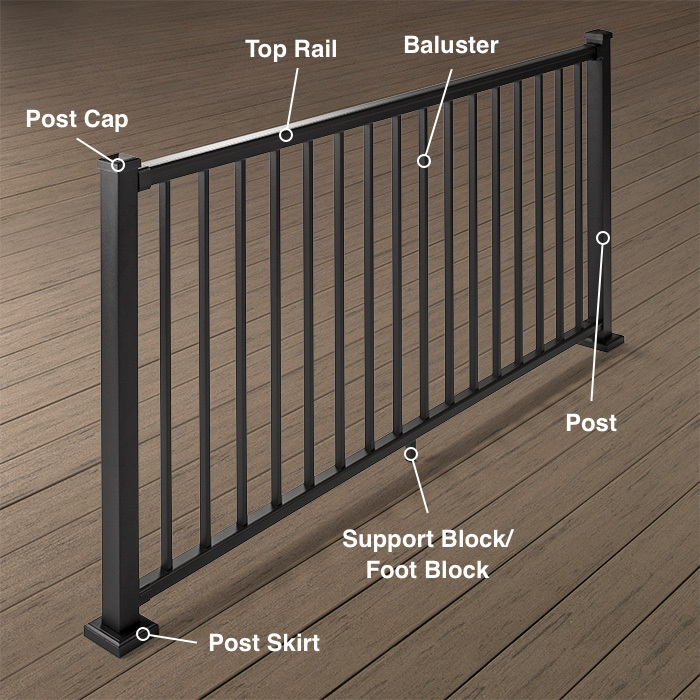 What are the parts of a railing? What is the standard height for a railing? How do I choose a baluster length? How far apart should I space my balusters? How do I calculate baluster spacing? How far apart should I space my balusters on stairs? How far apart should post be on a deck railing? My current deck has old wood balusters that are run-down. Can I take them off and replace them with a different type? Can I use these balusters on my indoor stairway -- or are they just for decks? My deck is made with pressure treated lumber, can I still install balusters? My balusters are powder-coated, can I paint them a different color? Can I custom order a special length of baluster? What’s the difference between a baluster and a balustrade? Typically, the International Residential Code (IRC) requires a deck, porch, or balcony to have a structural railing installed in order to pass a home inspection. Additionally, the majority of states require a graspable handrail to be available on all staircases per safety precautions. Code requirements are entirely dependent on your design details and the laws of your local area. They can differ from state to state, and even county to county; be sure to check with your local building department before starting any construction or updates. Structural building requirements are in place to protect the safety and welfare of people. Many municipalities require a building permit for the construction of a deck or patio, especially if it is attached to a house or is more than 30 inches off the ground. 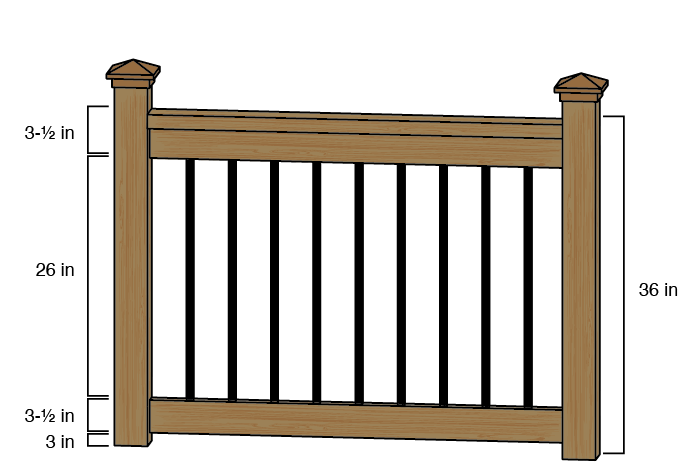 A railing section is typically comprised of four items: posts, a top rail, a bottom rail, and balusters. 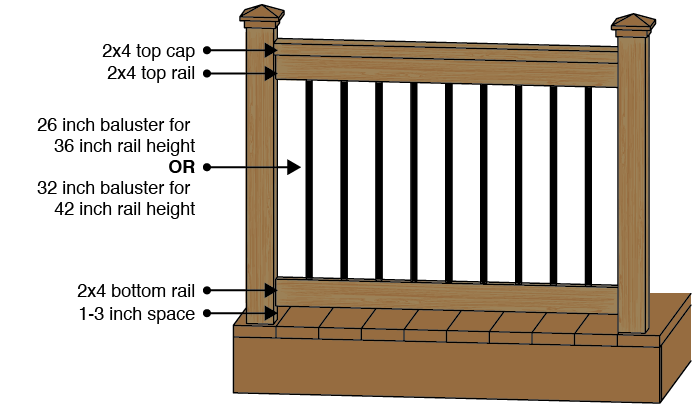 Take a glance over at our general railing image here to familiarize yourself. The basic parts may change as your peruse through different railing styles and systems, e.g. glass panel railing won’t include balusters. 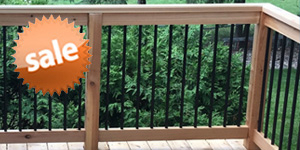 Overall, railing heights are typically required to measure 36 or 42 inches from the deck surface to the top of the railing. This can be contingent on many factors such as the height of your deck or balcony off the ground, whether it is a residential or commercial application and many others. Be sure to double-check with your local building office. 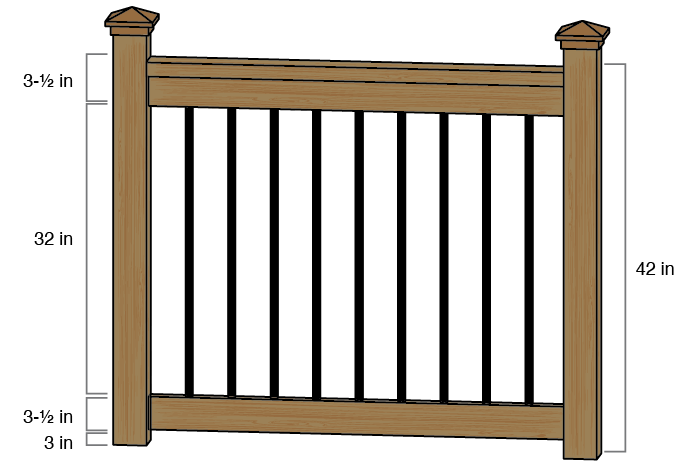 In general, International Residential Code (IRC) requires that the space between balusters be less than 4 inches. To accommodate for decorative details, this includes the widest space between balusters – not just the gap between baluster bases. If a building inspector is able to fit a 4 inch sphere through an opening, then it will be considered a violation. Since codes vary greatly from state to state, you should always check with your local municipality before installing or updating a deck and/ or the balusters. Everything is ready, the materials are right there in front of you. But how do you lay them out? Determining your baluster spacing is a crucial step in ensuring your railing meets building codes and looks uniform throughout. Balusters can not have a space of 4 inches or more between them per building code. Typically they are mounted between 3-¾ to 4-½ inches apart on center, as the baluster size will make up the difference. The standard code of 4-inch spacing between balusters applies to stair applications as well. However, due to the angle that the spindles are installed on, the spacing may be a bit wider. 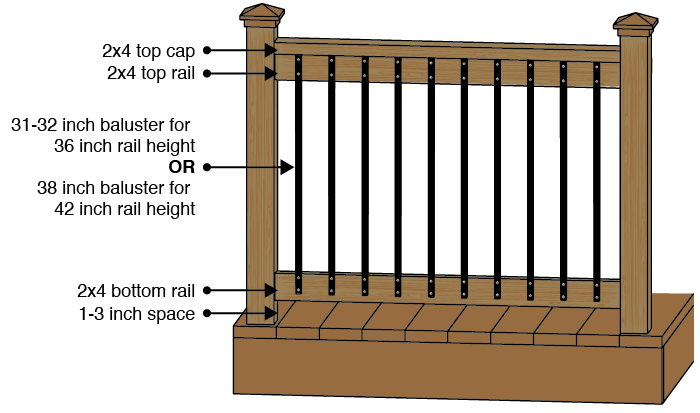 Generally, a space between 4-¼ to 5-½ inches between balusters will meet code requirements. Each brand and baluster style has their own installation and spacing instructions, read through carefully before installing. Builders and officials alike generally recommend that you mount and install posts no more than 8 feet apart. Typically, professionals like to keep posts at a symmetrical 6 feet apart throughout the deck. Standard metal balusters = Estimate 2.6 balusters per linear foot of railing. For example, 30 linear feet of railing would require around 78 metal balusters; 30 x 2.6 = 78. Standard glass balusters = Estimate 1.5 balusters per linear foot of railing. For example, 30 linear feet of railing would require around 45 glass balusters; 30 x 1.5 = 45. The most effective way to restore your deck, in both appearance and safety, is replacing your decaying wood balusters with something sturdier. To replace your wooden balusters, cut through them in the middle of the spindle and then remove the top and bottom sections from your rails. If installing new face-mount balusters, simply just follow the product installation instructions for a rejuvenated and safe new look. If installing balusters mounted between the rails, then remove the top rail and install per instructions. Of course, you can! All of the products on our website are generally created for outdoor deck applications, but plenty of builders install them indoors for a touch of character and distinctiveness. With vibrant finishes and intricate designs, the deck products we offer can help invigorate stairways and upper-level railings while adding the security you’d expect. Sure, you certainly can install balusters on your pressure-treated deck just be sure to use a coordinating connector, washer, or grommet. All of our aluminum balusters are powder-coated for a long-lasting finish, however, the edges and inside of the baluster will be uncoated aluminum. 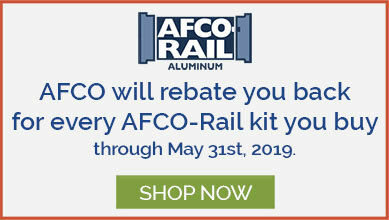 Pressure or preservative-treated lumber is corrosive to aluminum over time, therefore we recommend using a baluster connector when installing. This will create a safe barrier between the wood and the baluster. All of the balusters available on our website are carefully powder-coated to endure the elements and time alike. Although we cannot recommend painting over that finish, as it will void your warranty, most balusters can be painted over if properly prepared. 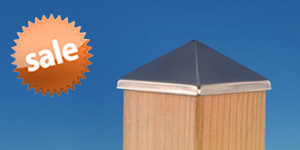 At DecksDirect, we have a myriad of color and finish options from a wide array of manufacturers. If you can’t find the baluster you’re looking for on our website, give us a call at 1-888-824-5316 and one of our deck experts will help you find the product you’re looking for. Generally, we recommend purchasing a longer length baluster and simply trimming it to the desired size. If that isn’t an option for you, please reach out to us at decksdirect.com, and we’ll work with you to find any special or custom-made items that can work for you. 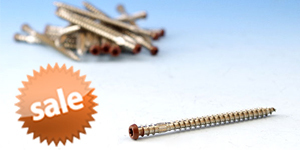 Note: Special order items may not be available in all styles or from all manufacturers. A baluster refers to the vertical piece that runs between the top rail and bottom rail on your deck. A balustrade is a term for a complete and assembled rail section; that includes the top rail, balusters, and bottom rail.